Throughout this post, I’m probably going to mainly use the term “tautology” rather than “circular reasoning” because it’s less to type. Circular reasoning is, like most fallacies, just what it sounds like: Making a circular argument, or when each stage of an argument refers back to the previous stage, or uses the previous stage as justification for that one. You just go around in circles. Another way in which a tautological argument is used is to simply state the same thing twice, but in different ways. Like saying, “This is a brand-new never-before seen product!” is considered a tautology because “brand-new” and “never-before seen” mean the same thing. This isn’t directly related to astronomy, but it underlies almost all young-Earth creationist claims and so I’ll put it in here. It would seem that the idea of biblical authority would be better-relegated to my upcoming post on the Argument from Authority, but it actually is a tautological argument as well. Me: Why is the Bible true? YEC: Because the Bible is infallible. Me: Why is it infallible? YEC: Because the Bible is the word of God. Me: How do you know it’s the word of God? YEC: Because the bible says it is the word of God. Me: But how do you know that it’s telling you the truth? We have entered the tautology. The YEC has not brought in outside information into the argument to back up the claim, they simply continue to go in circles. Circular arguments and/or tautologies are yet another illogical way to argue because they do not bring any new information into the discussion. Rather, they argue what has already been (correctly or incorrectly) stated, and do not back it up with something else. It is not correct to equate circular reasoning with a tautology. A tautology is a formula that is true in all instances, for example the formula (A AND A) and (A OR NOT A) are both tautological and non-circular. On the other hand the “fallacy of circular reasoning”, aka “begging the question”, is one where the conclusion exists (implicitly or explicitly) as one (or inside one) of the premises in an argument. Moreover, it might strike you as odd that not all circular reasoning is fallacious. If you are interested, a good read on this topic is at: http://www.fallacyfiles.org/begquest.html. A simplistic Mathematical Formula A=A, is a tautological “truth” that rests on circular reasoning. The conclusion is contained in the premise. Thus tautology is equivalent to circular reasoning. PS: A mathematical “truth” is not necessarily true “in all instances”. It is only “true” within its defined set of rules. I disagree with your colorful yet inaccurate wheel at the top of the blog. You assert that all those who demonstrate confidence in Biblical veracity do so based upon no evidence. This is nonsense of the highest order. Conduct some research into the intellectual journeys of former atheists and skeptics, such as CS Lewis, Josh McDowell, Simon Greenleaf, and others. The weight of evidence from such varied sources as archaeology, fulfilled prophecy, the evidence of the resurrection, and other internal evidences (sphericity of the Earth in the Bible, etc) led to their intellectual arrival of the reliability of the scriptural record. “Survival of the fittest” is sometimes claimed to be a tautology. The reasoning is that if one takes the term “fit” to mean “endowed with phenotypic characteristics which improve chances of survival and reproduction” (which is roughly how Spencer understood it), then “survival of the fittest” can simply be rewritten as “survival of those who are better equipped for surviving”. Furthermore, the expression does become a tautology if one uses the most widely accepted definition of “fitness” in modern biology, namely reproductive success itself (rather than any set of characters conducive to this reproductive success). This reasoning is sometimes used to claim that Darwin’s entire theory of evolution by natural selection is fundamentally tautological, and therefore devoid of any explanatory power. However, the expression “survival of the fittest” (taken on its own and out of context) gives a very incomplete account of the mechanism of natural selection. The reason is that it does not mention a key requirement for natural selection, namely the requirement of heritability. It is true that the phrase “survival of the fittest”, in and by itself, is a tautology if fitness is defined by survival and reproduction. Natural selection is the portion of variation in reproductive success that is caused by heritable characters (see the article on natural selection). Skeptic Society founder and Skeptic magazine publisher Dr. Michael Shermer addresses this argument in his 1997 book, Why People Believe Weird Things, in which he points out that although tautologies are sometimes the beginning of science, they are never the end, and that scientific principles like natural selection are testable and falsifiable by virtue of their predictive power. Shermer points out, as an example, that population genetics accurately demonstrate when natural selection will and will not effect change on a population. Shermer hypothesizes that if hominid fossils were found in the same geological strata as trilobites, it would be evidence against natural selection. Utterly False Straw Man argument!!! You are either ignorant of, or lying about, the process of determining ages of fossils and the sedimentary layers they are contained in. You can’t even source your argument because no paleontologist has ever said that. What kind of logical fallacy is “The Doctor isn’t in because he’s out”….or I didn’t do it because I would never do a thing like that, therefore it couldn’t have been me. 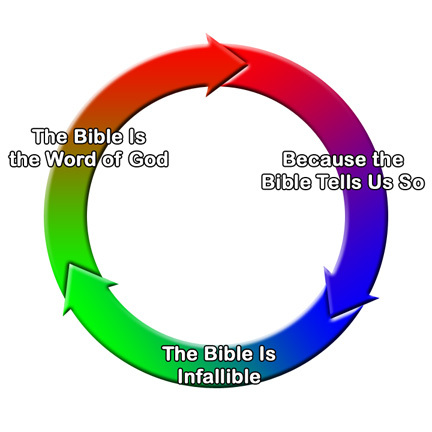 It is ironic to note that those that decry belief that the Bible is the Word of God as being ‘circular reasoning’ also assume what they want to prove. That is, they will claim to depend on ‘reason’ as their ultimate standard to which they appeal. If I were to ask what their reason is for that, their response will assume what they want to prove. Attempting to employ logic to prove logic. The very same principle is used when Christians prove a theological point by quoting scripture. So in short, if someone states that you can’t use the Bible, to prove that the Bible is true, then to be consistent no one can use reason to prove that reason is true and valid either. Some things are simply axiomatic, that is, self-proving. For example, the thousands of prophecies in scripture, including the 300+ concerning the coming of Christ fulfilled to minute detail is proof in itself. All humans being finite have an axiomatic starting point, for the ‘atheist’ it is unbelief, for the Christian, it is belief. The real question is: where do the facts lead? “Reason” is an abstract concept, not an individual piece of evidence. The Bible is one line of supposed evidence for something. It needs other things to corroborate it if you hope to have an objective approach. Usually when a child hears one of his parents say, “Because I told you so”, he had better listen and obey or there is the risk of punishment. In the same way, the believer seeks to heed and obey the word of God. Believers start with belief, axiomatically. Non-believers start with disbelief, axiomatically. The problem with belief in something as your starting point is which belief to select. If you consider evidence, i.e. fulfilled prophecy, in selecting a belief, you are not starting from a belief, you are starting from trust in your own reasoning and following the evidence to a belief that you find reasonable. If, instead, you do what you claim you are doing (The Whyman), that is, picking an a priori axiomatic belief, you are choosing to utterly ignore evidence. In that case you had better hope you are lucky enough to guess right. Point is, both “believers” and “unbelievers” are relying on reason. Believers are using reason to it’s utmost and then faith (in their chosen a priori belief selection) once belief becomes unreasonable. This statement fails to consider other possible conclusions, and then it fails to select the most probable. Other possibilities might include, 1) those who wrote the New Testament did so in order to make it appear that Jesus fulfilled what had already been written. 2) In order to secure Roman hegemony, the Council of Nicea decided what of many books and texts to keep and which to edit in order to shore up the Roman Empire under one religion. 3) many prophesies are simply ambiguous enough to describe a broad range of events. For hundreds of years people have been claiming X or Y is a fulfilled prophesy of Nostradamus. All believers should embrace this following simple idea: the Bible exists to give meaning to our lives (we are here to prepare ourselves for everlasting life by following God’s law) while Science seeks to explain how things work. The two are not incompatible, they are not mutually exclusive, they complement each other. For example, I have a watch. Technology tells me how it works. Meaning tells me why I need one.